this average force will result from compressing both barrel return and bolt springs through the required recoil distance. The first problem that presents itself in this connection is how the spring resistance should be proportioned between the springs. 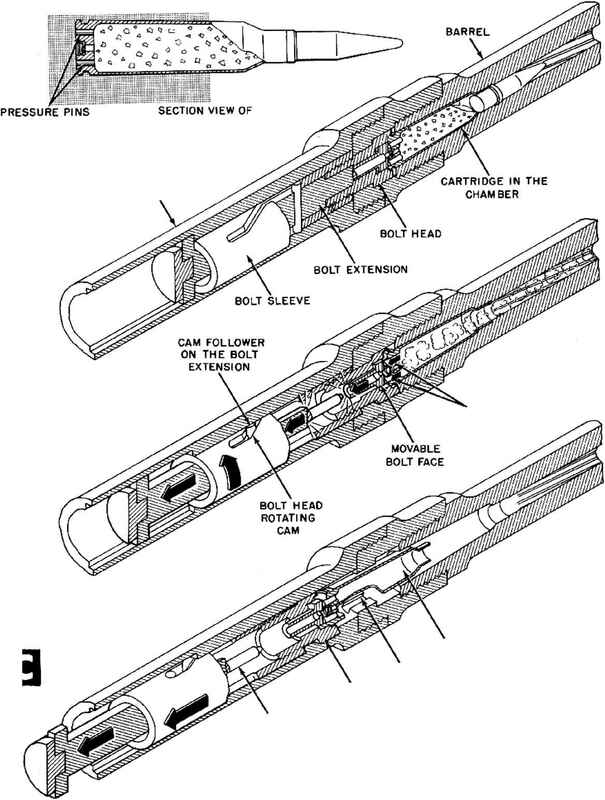 One obvious choice would be to make the spring resistances proportional to the weights of the barrel and bolt respectively but if it is important to obtain the maximum possible rate of fire, the particular spring combination which would produce this condition should be determined before the selection is made. The effect of the manner in which the springs are proportioned to each other will become apparent during the counter-recoil strokes of the barrel and bolt. During recoil both springs act together but during counter-recoil the barrel spring returns the barrel to battery and then the bolt driving spring returns the bolt. The strength of the springs will determine the time in which these parts are returned and by proper choice of the springs, the total return time can be held to a minimum. The following calculations show how the ratio B between the average forces exerted by the barrel spring and bolt driving spring is determined so that the total return time will be minimum. At the end of the counter-recoil movement, the kinetic energy in either the barrel or bolt will be equal to the average force exerted by its spring times the counter-recoil distance.